I think I may be a little behind the times in discovering this product. Oh, well. This isn’t the first time and probably won’t be the last, but I thought I’d share my discovery anyway just in case there are others out there who haven’t tried these. When I’m in weight loss mode, I have to find a way to have pizza since regular pizza is in no way something that works well when trying to count those calories. In the past, I’ve been fairly successful using lowfat, high fiber tortillas. They are a little flimsy, however, so sometimes don’t hold up well, especially, if I cook the pizza on the grill. 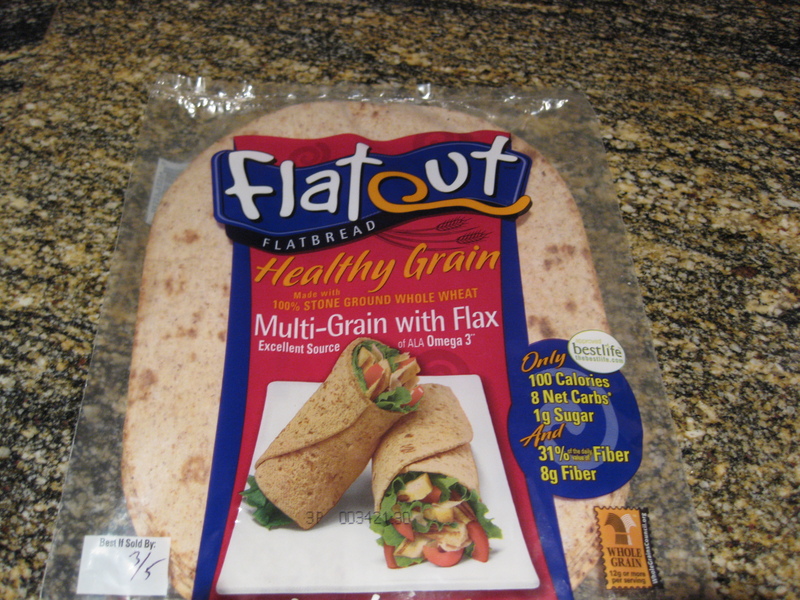 All that is now going to change now that I’ve found Flatout Flatbread!! It is only 100 calories per large, oval piece. There is 8 grams of fiber in each as well which I think is a good thing. I tried the Healthy Grain variety that is made with 100% stone ground whole wheat with other grains and flax. Now, when I bought these I thought that given the high fiber aspect that these could very well taste like cardboard . . . . but they didn’t!!!! They are not dry at all and have a nice flavor that works well with pizza or to make sandwich wraps. You get six flatbreads per package. I understand that they make several flavors so I’ll be on the lookout for those to try as well. I’ll post a pizza I made using these in a few days. I’m looking forward to making some on the grill now that the weather is warmer!! Oh I am definetly goingto try this ..what store did you find it at? I found them at the grocery store. Your post above sent me on a search for multi-grain flat-bread which turned into a journey of enlightenment over sprouted grain breads. Posted today, but a little rude so I didn’t link. Oh and I am watching for the pizza post.